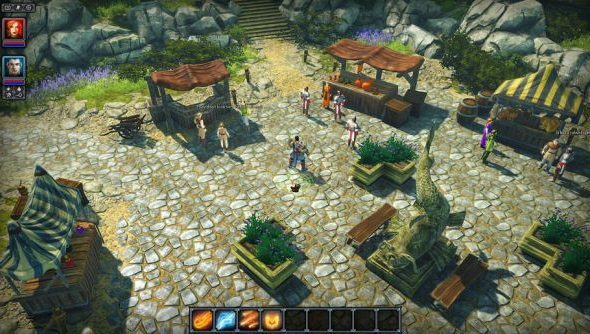 You might remember Divinity: Original Sin selling 500,000 copies in its first two months on sale, and developers Larian planning to leave Kickstarter behind. Well: they’ve changed their minds. Not without due consideration, mind you. In fact, you might say this is all due consideration’s fault. Larian CEO Swen Vincke wondered aloud on his blog whether the return of success stories to Kickstarter might actually help smaller projects – rather than pull funding away from them, as he’d previously worried. Vincke referred to the ICO analyst’s report which suggested that, based on current trajectories, Kickstarter games in 2014 will make less than half the amount they did last year. ICO pointed to a dearth of projects from big name developers this year – and the effect that this could have not only on the annual total, but the individual totals of Kickstarter projects from lesser-known studios. This is the halo effect: the idea that successful crowdfunding projects can bring more people to the crowdfunding scene, and benefit everybody. Larian had previously decided not to run a new Kickstarter campaign to avoid abusing a system which has “rekindled innovation in an overconsolidated market”. But they might yet return to the crowdfunding pool if it’ll help keep the movement alive. “While this is in no way an announcement that we’re preparing a new Kickstarter campaign, I am genuinely wondering if we shouldn’t start reconsidering our position,” said Vincke. Have a think about your own crowdfunding habits. Has a bigger project led you to back something smaller?